Stay at the Charlotte Marriott City Center and you’re not just in the heart of North Carolina’s capital city; you’re inside an innovation lab. This is no typical hotel; it’s the brand’s gold standard. Renovated with modern tech and sleek décor, the property functions as a live-action hospitality experiment where Marriott tests new concepts and uses guest feedback to tweak anything deemed less than ideal. For example, guests didn’t love the new computer nesting tables, so traditional desks replaced them. Successes, like a mobile key app, will be fine-tuned and rolled out to other Marriott locations. Coco & The Director is the hotel’s on-site coffee shop. “Beta buttons” throughout the property make it easy to offer immediate feedback. Like the personalized check-in process? Tap the button. Like how easy it is to find a place to plug in? Tap the button. Enjoy the free snacks in the M Club? Tap the button. And so on. A screen in the lobby broadcasts which innovations are trending. The building feels new but was originally constructed in the 1980s. The open, main floor has an urban, residential vibe. Guest rooms have open closets, seating areas separate from the comfy beds, and showers with dual water jets. A sense of place is conveyed via local art, pottery and food products, plus staff members’ warm Southern hospitality. Want to get active? 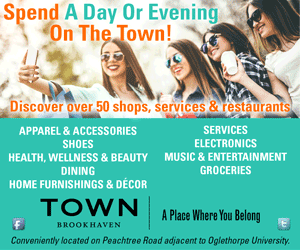 Head to the fitness center for more than 600 digital training sessions at the click of a button, plus local running and biking routes selected by area athletes. Dining and entertainment options are on the main level sprawling beyond the lobby. Stoke Restaurant, Stoke Bar and Coco & The Director have all become community hubs. Stoke serves elevated, seasonal dishes in a modern dining room. The chance to dine at Stoke is reason enough to drive up I-85 to Charlotte. Helmed by Chef Chris Coleman, Stoke showcases fresh ingredients sourced locally as much as possible. 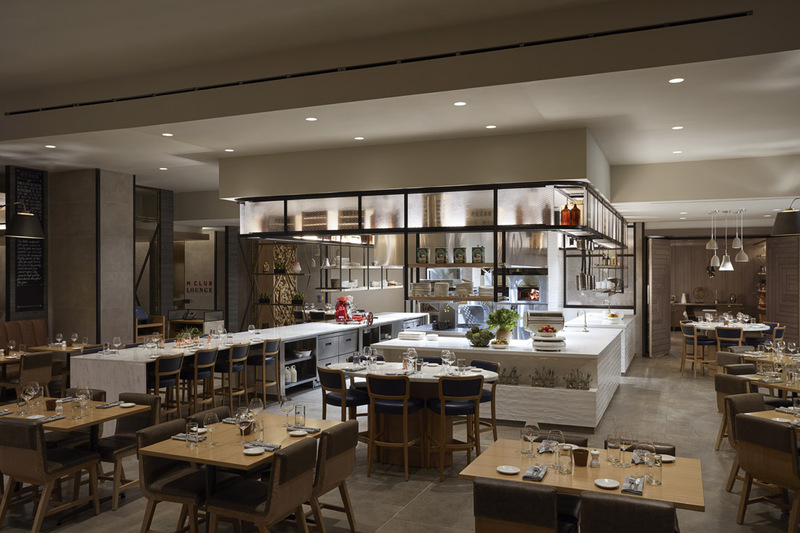 The open kitchen and relaxed atmosphere lure as many locals as hotel guests. Stoke has evolved slightly since it first opened. “We’re still very relaxed and approachable—our dishes generally use five or six ingredients,” says Coleman. “But we took the food up a bit to play around with more interesting techniques and refined plating. We’re still a seasonal restaurant, but we try to elevate the menu each time we change it.” This spring, look for creative pasta dishes and new influences. “We have some new cooks bringing their different voices to the menu as well,” says Coleman. As one example, a new cook from Kentucky is introducing mutton with a Worcestershire-based barbecue sauce. 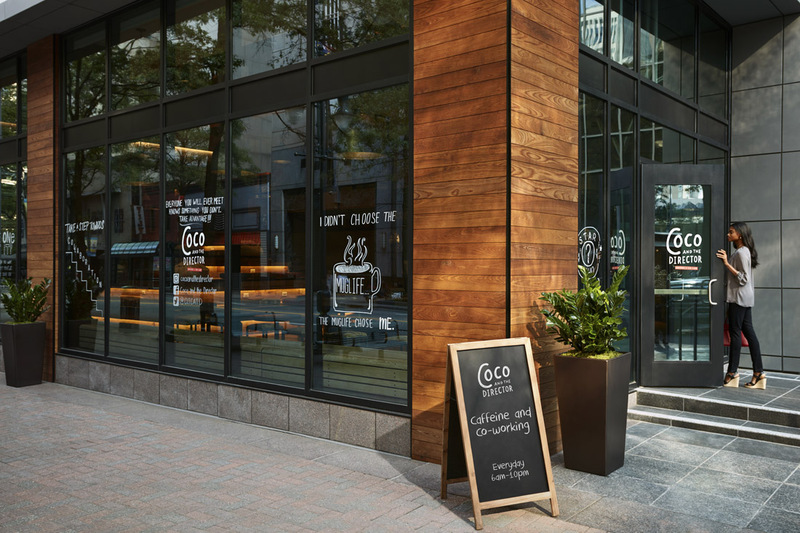 Coco & The Director, the on-site coffee shop, features single-origin, locally roasted beans. In addition to your favorite coffee drink, you can grab soup or a sandwich. Charlotte Marriott City Center is a place to relax, play, eat, tap into trends and share your opinions in 3-D reality—not just online. Venture beyond the hotel, and whatever you’re in the mood to do, Charlotte’s got it.